In Ep. 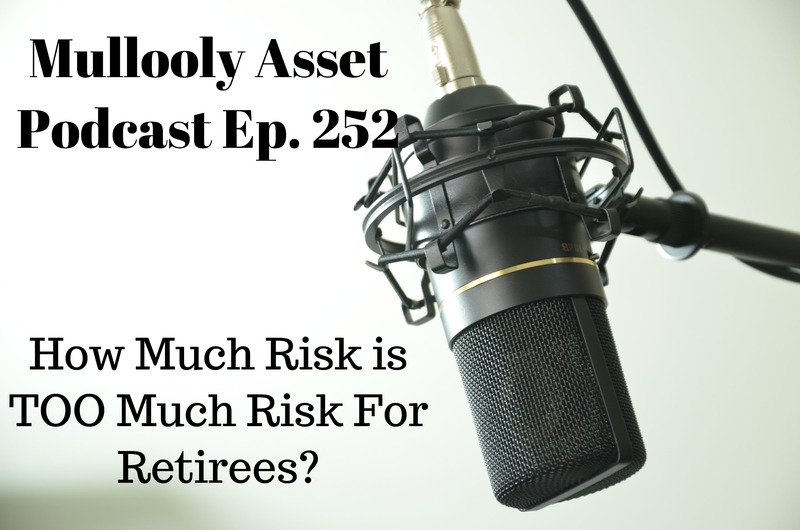 252 of the Mullooly Asset Podcast, Brendan and Tom tackle two very important topics. They discuss an article written for retirees and pre-retirees about having potentially too much risk in their portfolios. They also talk about a few common misconceptions between mutual funds and ETFs that they’d like to set the record straight on. If you’ve got a topic you’d like Brendan and Tom to discuss on a future podcast, let us know! Tom Mullooly: Welcome to the Mullooly Asset Management podcast. This is episode number 252. Your trusty hosts are back in the saddle, Brendan Mullooly and myself, Tom Mullooly. Brendan, welcome to another episode. Brendan M.: Yeah, back at it again. Got some good topics to talk about this week. Tom Mullooly: There was an article that you and I both read in MarketWatch a day or two ago talking about how skilled managers … There’s always that story that money managers can’t beat the indices, so why bother trying? Interesting study where they kind of pulled this data from. I think they kind of twisted the information. Brendan M.: Yeah, and I didn’t really care for the title, but I can’t put that on the author, as we’ve said before. Investors’ Widely-Held Beliefs That ETFs and Index Funds May Be Wrong. Tom Mullooly: So some good click bait headline work going on there because it got both of us to read it. Brendan M.: Right, definitely. And the picture they had was like some lady who presumably had just discovered her index fund may not be all she thought it was and was like screaming or something, which is … Anyway, they looked at this data. It was across 2,000 mutual fund trades from 1998 to 2015. They took the approach of separating it into trades that mutual fund managers made because of inflows or outflows into their fund, versus I guess, because they liked or disliked a certain stock. Tom Mullooly: We both agree, I don’t know how he made the leap from a post that was written by a couple of professors. Brendan M.: Yeah, it was an academic article. Tom Mullooly: Yeah, talking about how some money managers and the transactions that they made either immediately before or immediately after earnings releases for the holdings that they had. And he was able to twist this into why investing in an ETF or an index fund may be the wrong way to go. Brendan M.: Again, it was something to get clicks. But even one of the stats quoted in the article talked about how the top 20% of these funds that they had identified outperformed the bottom by 1.27%. To clarify, what it actually said in the academic piece was that the top quintile was greater than the bottom quintile by that amount over the following 12 months after these trades were made. So it doesn’t mean overall, or every year on average, or that the same funds were the top quintile. The top quintile is always changing. Brendan M.: It’s the same information that you talk about when you read the S&P studies, the SPIVA studies that look at the percentage of funds outperforming index over one, three, five, 10-year, 15-year now time horizons. There are and there have been, I think the latest one had 15 year data and 15% of large cap managers had outperformed over the prior 15 years. That doesn’t mean that they’re the same ones every single year. And there really isn’t any repeatability in terms of the same winners continuing to win. And so to say that you could identify who’s going to be in that 10% or 15% year after year is just ridiculous. It’s nonsense. Tom Mullooly: And it’s also a waste of time in what you’re trying to do. Tom Mullooly: So they broke down these trades that these fund managers did into basically two buckets. Brendan M.: They were either because of inflows or outflows into the mutual fund or because presumably, they had feelings about the stock, they liked it or they disliked it, just more natural versus artificial, like, forced upon them. Tom Mullooly: So the first bucket really is because of the day to day management of the fund. There’s money going out or there’s new money coming in. Brendan M.: Right. Like they don’t have to take people’s money for these mutual funds. Part of the whole gist of the article was saying that these fund managers would just be better off if the investors would leave them alone, which is super cranky. It’s like it may be it may be right to an extent but also, if no one gives them money anymore, then their fund will just cease to exist because it won’t have assets. Tom Mullooly: These customers, what are they doing? Get out. Brendan M.: Yeah, we don’t want customers. Get out of our store. That’s basically the tone they’re taking with this. Tom Mullooly: Well, what’s also interesting and something we could probably do two or three podcast episodes on, is how the mutual fund industry, and to a certain extent the ETFs now, when there’s less interest in a fund or less assets in a fund, they simply just close the fund or they’ll roll it up into another fund in the same vein or in the same family. And so a lot of those historical poor returns just get erased. Brendan M.: Yeah, that is something that happens, especially with mutual funds, but ETFs close too for sure. Like you’re saying, it’s just really tough for me to buy that these managers would be like better off without inflows or outflows. Obviously, sometimes that is going to force their hand, especially on outflows because, and we’ve seen a real world example of this where client of ours had a mutual fund that they’ve owned now for many years. Tom Mullooly: 20 years almost, something like that. Brendan M.: Yeah, back since before the financial crisis. So yeah, approaching over a decade, for sure. Brendan M.: Anyway, so they’ve owned this fund, and it has just faced nothing but outflows since they bought it. And part of that is due to financial crisis. Part of it is due to more people leaving the active mutual fund space all together and buying things like ETFs and index funds because they’re cheaper and more efficient in many cases. Tom Mullooly: These particular folks had these fund shares in a taxable account. So every single year, they had massive capital gains that we’re adding to their cost basis. Brendan M.: So the managers of this fund would be a good example of that where they’ve been managing a shrinking pile of assets now for over a decade. I’m sure that has hampered some of the transactions that they’ve wanted to make and maybe they’ve had to sell some stocks that they didn’t want to, which meant unloading some big capital gains, which then they passed along to the remaining shareholders. So structural issue that mutual funds have when compared to ETFs, ETFs don’t really have that issue. Maybe that’s something that should be extended to mutual funds too. I don’t know. I’m not sure why ETFs get it and not mutual funds. But to this article’s point about why these mutual funds would be better off if people just left them alone, when you manage a mutual fund, obviously first and foremost, your duty that everybody thinks of is that you’re going to buy and sell stocks that you have views on and that you’re aiming to outperform some kind of a benchmark. But secondarily, you can’t take on that position and then claim ignorance to the fact that you’re going to also have to manage inflows and outflows. Tom Mullooly: That’s part of the job. That’s like turning the lights on every morning. Brendan M.: That’s equally as important as being skilled at picking stocks is being skilled at managing the inflows and outflows and taking this into account. You know that there are going to be inflows and outflows. Figure it out. Like you can’t say that, “Oh, I would have performed except for those pesky outflows.” It’s like Scooby Doo at the end of the episode. Like, “Would have been fine except for those meddling kids.” Come on. Tom Mullooly: Yeah, ruh roh. This was I think pretty easy pickings for us in terms of being able to poke holes in a lot of this stuff. Brendan M.: Yeah, it’s tough. I get where they’re coming from with some of it, but I really didn’t care for the way that it was presented, like as if it was a gotcha moment for ETF or index fund investors, like they had made some kind of a mistake. Because a lot of this has to do with mutual fund structure and how it sometimes works against otherwise skilled managers. But if the structure is the problem, then so what? Does it make me feel better that I paid for skilled under performance because of the structure? I don’t care. I don’t care if there was a skilled manager who only underperformed because of inflows and outflows that forced his or her hand. Tom Mullooly: Still under performance. Brendan M.: I don’t really care. So to pay more for that moving forward into the future, I don’t think it makes a lot of sense, and that is why more people are moving into things like ETFs and index funds. So you see hit pieces like this from defenders of the other side occasionally and I think that this one was particularly poorly put together. Tom Mullooly: I think what really kind of stung me was right at the very end of the article where the author said exchange traded funds are very cheap so it makes it easy for the investors to trade them and they can move in and out. It encourages Joe Public to trade in and out of these things. I have a problem with that. Brendan M.: They are definitely easier to trade than mutual funds, but I’m not sure that that makes them bad. Tom Mullooly: I don’t think they’re really … I don’t know. It’s a philosophical thing for me in terms of hey, you’re going to put money into a basket of stocks. There’s going to be some under performers, some over performers, but if you’re buying into an index or a class, this is what you should expect with this. So to use that as a trading vehicle, I just don’t think that’s really the best one out there. A mutual fund would be worse because you’ve got a lot more costs and expenses packed into these things. So trading in and out of mutual funds, never a good idea. Trading in and out of ETFs, probably not a good idea. We wouldn’t condone it. Brendan M.: Never a good idea either. So if you’re buying an ETF or an index funds because it’s cheaper than its closest counterpart in the mutual fund family, maybe you’re saving like a percent on the expense ratio, but then you’re going to trade the ETF or mutual fund, add in your trading cost and whatever tax implications there are too and you’ve just eroded the hundred basis points you might’ve been saving by using something cheaper. So there is no benefit anymore. So I think that it’s never a good idea to be buying those to trade either because as long as you’re aware that you’re completely eroding all of the benefits of owning an ETF by trading them actively on a daily or weekly basis, then sure, knock yourself out. All else equal. I agree. I’d rather see people trading cheaper things and then more expensive things, but either way, I think you’re an idiot if that’s what you’re doing. DISCLAIMER: Tom Mullooly is an investment advisor representative with Mullooly Asset Management. All opinions expressed by Tom and his podcast guests are solely their own opinions and do not necessarily reflect the opinions of Mullooly Asset Management. This podcast is for informational purposes only and should not be relied upon as a basis for investment decisions. Clients of Mullooly Asset Management may maintain positions insecurities discussed in this podcast. Tom Mullooly: Pretty good article from Christine Benz at Morningstar, friend of the firm. We should say that she was a previous guest on Tim’s podcast, Living With Money. Brendan M.: Great episode to go check out, lots of wisdom packed into that episode. Tom Mullooly: And so her article that was in Morningstar a couple of days back, the headline was, Hey Pre-Retirees, Are You Taking Too Much Risk? I thought this really covered a lot of things that we cover here in the conference room. Brendan M.: This is interesting because, and we see both sides of this conversation, but this is I think the one that you see less. We see a lot of people in this pre-retirement or just entering retirement phase of their lives and they’re more concerned with taking any risk at all and they don’t think they can afford anything, no risk, like I can’t afford risk. It’s something that we hear all of the time. Conversely, Christine is discussing people here who are taking way too much risk and it may just be something that they’ve grown accustomed to over the course of their career. She talks about it in terms of they had one job for the longest time in terms of their investment assets. Tom Mullooly: It was the accumulation phase to save, save, save, save. Brendan M.: Right, and so getting people to dial back or recognize that they no longer have to bear that amount of risk as they enter a different phase with their money is not always easy. It’s not always an easy sell to make. Tom Mullooly: So talk a little bit about comparing a 100% stock portfolio versus a 60/40 or 70/30 portfolio over a retired person’s cycle, 20 or 30 years. Brendan M.: Yeah, it’s interesting and I’ve seen it displayed this way before. If you took two hypothetical portfolios and showed returns over the last 20 years, let’s say, one that’s a 100% stocks and one that’s 60/40 stocks and bonds. Tom Mullooly: Alright, just thinking without seeing any numbers or any graphs or anything, my first thought is the 100% stock portfolio is going to do great. Brendan M.: Yeah. They’re both going to do great over a 20 year period. You’re going to make plenty money. And especially over the last 20 year period, even that included two bear markets, still looks pretty good. Without any specific numbers though, you look over a period of time and stretched over a long enough period like 10, 20, 30 years periods of time that retirees even have in front of them, which is interesting to discuss too because a lot of times people have this opinion that they don’t have time anymore, which ties into their inability to take risk or whatever. But to show the returns of something over that period of time, they’re both going to grow but in most cases and historically right now, the 100% stock portfolio has done better. And so all else equal, you ask somebody which one they would have wanted over the last 20 years, let’s say, and most people are going to say, “I want the 100% stock portfolio.” Sure. Higher returns. Tom Mullooly: I’m going all in. Brendan M.: So to layer on a second piece to this exercise though, you take the same exact portfolios, 100% stocks, 60/40 stocks and bonds over the last 20 years, and you add in something like a 4% withdrawal rate each year on this pile of money that has been compounding. And it’s interesting to see that a lot of times the more conservative portfolio in this case is going to look better because it’s not strictly growth that we’re looking at anymore. It is growth in the context of also withdrawing 4% a year or whatever the numbers are. And you can work this with host of different variables, but the point being when you show it that way, most people want the more conservative portfolio. And it just speaks to the idea that when you’re withdrawing on your assets, the highest possible growth rate is not necessarily what is going to mean the best probability of success for you not running out of money. Tom Mullooly: Before we turned the mic on, I was talking about how if you were do not look at this over 20 or 30 years, but instead zoom in on the graph, see the drawdowns that 100% portfolio would have, it’s going to make people second guess their decisions and they’re going to wonder, hey, we’ve had two years of negative returns plus withdrawals. Brendan M.: Yeah. Imagine a 40% draw down that lapses over two years. So over a two year span, you’re in different phases of what ultimately ends up being a 40% draw down, which is certainly possible in a 100% stock portfolio. That’s just a bear market, basically. It’s not anything special. These things occur. Brendan M.: Right, so your portfolio is 60% of what it was and let’s say it’s $1 million portfolio and you also withdrew 4% each year, maybe you withdrew something in the realm of another $60,000 to $80,000 over that timeframe. Man, your portfolio is now cut in half, right? Between withdrawals and market action, are you going to be able to feel okay about that? I feel like that’s going to have to start creeping into your decisions in terms of how you’re spending this money. And then because you psychologically wanted to stay in something that was higher growth because you were used to it or you feared that there wouldn’t be enough otherwise, you’ve then put yourself in that place where you could at least be a little bit better off if you had a portion of your assets in something that holds up when the market doesn’t do well, like high quality bonds or treasuries. Tom Mullooly: In the article, Christine actually quoted Bill Bernstein who wrote The Four Pillars of Investing and a couple of other books. Brendan M.: Many other good ones. Tom Mullooly: Yeah. One of his famous lines is, “When you’ve won the game, quit playing.” She goes on to say basically thanks to the equity market, many pre-retirees and retirees have effectively won the game. Having amassed the assets they need for a comfortable retirement, they should transition at least a portion of their portfolios into safer things. My question is, and this really gets down to what a planner or an advisor does for a client, is how does someone, an individual know that they’ve amassed everything that they need? Brendan M.: Right. And again, before we had this discussion here, we were talking about that point and you were saying that you feel like a lot of people stay in portfolios that look that way because just that deep seated fear that I think all of us have to some degree of not believing that there will ever be enough. Brendan M.: I think we all innately feel that way all the time. No matter what we’re talking about, whether it’s money or opportunity or whatever it may be, just that there’s never enough, that the goal posts are just a little bit further. Even if we’ve reached a goal that we had already set out for ourselves, there has to be something more. There’s a little bit more. We’re never satisfied and you know, part of that is good because it’s what gets us up and motivates us to continue working hard and do things with our life. Brendan M.: Yeah, it isn’t healthy. And so it’s part of the question that we answer for people when they come to the table with us is, here’s where I’m at. I’ve been accumulating for my whole life. Can I retire? If so, what will that look like? And we can help apply some context to the situation. As one of Christine’s recommendations was, to factor in your planned spending when you’re trying to figure out, how much can you shift to something safer? What do you start? What are you going to need on a year to year basis to continue living your life right now? That’s a good place to start. And then maybe you start by shifting a handful, if you want to think of it, just in years of expenses. Move X years of expenses. Tom Mullooly: Two years, three years, yeah. Right. So Christine shared some numbers. You and I know it, but I think it’s worth sharing on the podcast. In rolling 10 year periods since 1936, stocks have generated a positive return 97% of the time. You want to explain what a rolling 10 year period is? Brendan M.: At any point in time, looking back like from today, 10 years prior back to 2009. Or it could have been last year looking back to 2008. Or it could be into the future, looking to 2029 from today or wherever you want to draw the line. Tom Mullooly: So on a rolling 10 year period going all the way back to 1936, stocks have generated a positive return 97% of the time. The problem is when you start to zoom in on that. Tom Mullooly: Positive return could be a fraction of 1%. Brendan M.: Right. Nonetheless, good foundational information to build a portfolio off of. If we’re having the opposite conversation as this, which is this hypothetical person wants to remain in their 100% stock portfolio. There’s also a lot of people who get to retirement and believe that they’re going to flip the switch and stop taking all risk. That is not going to work either because most people, while they may be able to afford dialing back on the risk once they approach retirement, they can certainly not afford no growth in retirement. You need to just be independently wealthy. I have enough money to put my money into CDs at the bank and just hang out for the rest of my life. Hey, if you’re there, great. Brendan M.: We don’t talk to a lot of people that are there. Tom Mullooly: But what if you were thinking about flipping that switch from risk investments to non-risk investments at the end of 2008 or at any time in 2009? Brendan M.: Right. And so a more timely way to approach that could be to … And hopefully you’re not, this is a decision that’s being driven by you not wanting to work as much anymore. Maybe you’re dialing it back or just retiring fully and you’re not going to work anymore. But you make these decisions as your life dictates and not as a reaction to a market event. If you’re going to dial back risk, it should be because you’re transitioning into a part of your life where you’re going to need to begin relying upon your assets to some degree and you do that commensurately with the changes that are happening to you, not, oh wow, stocks are down 20%. I guess I should get less aggressive. Tom Mullooly: Yeah. I guess I should make a change now. And I’m glad you brought that up because that is a conversation that we have, unfortunately, too often with people where they’ll start out the conversation by, hey, the market’s down 20%. I guess I should start getting defensive. No. Tom Mullooly: Lot of times, we’re going to have conversations with our clients and we’ll say, “Okay, you are retiring now, or now you’re age 70 and you’re going to start taking distributions from your pension or retirement or whatever.” Let’s now talk about how we should change your asset allocation. It’s not driven by what’s happening in the market. A lot of times what we tell clients is, you need to tell us what’s going on in your life. That is going to dictate the changes that we may consider for you. It’s not going to be because of what’s happening in the market because we need the market to hit our goals on the growth end. Brendan M.: And we’re also building plans that take into account the fact that markets do decline and on a pretty regular basis. So we’re not building any plans that are contingent upon sidestepping the next bear market because if we had to build plans that were contingent upon that, I don’t think I would be in this line of work because it wouldn’t be possible. Brendan M.: Nobody’s financial plan that we’ve built here is, okay, we’re going to withdraw X per year and you’ve accumulated this, we’re going to have this much in stocks and bonds, and oh by the way, we’re going to forecast the next bear market and you’re going to sidestep it entirely. No. Tom Mullooly: Yeah, it just doesn’t work that way. Tom Mullooly: Just eliminate your money. Brendan M.: Yeah, or gives you bond-like returns for a very high price. Yeah. Tom Mullooly: Well, that’s going to wrap up episode number 252. Thanks for tuning in and we will catch up with you on the next episode.